Google Chrome is perhaps one of the widely used mobile (and desktop) browsers in the world. I can say this for two reasons – 1) It’s by Google. 2) It’s Good. Well, the #2 was basically because of their simple interface + unlimited powerful extensions. I really loved them. So when Google announced the mobile version for Chrome, I was very excited to try it. I’m using it ever since they launched. Chrome for Android provides me the same desktop experience. You might have been using Chrome for searching information online, but what if you want to search for something on a blog post? What if, you don’t know the meaning of a specific word? Previously you need to copy that word (or remember the word) and go to a new tab, search for the meaning. But now, we have this simple trick (and feature) for time-saving. Thanks to Google’s “Touch to Search” feature, now you can search using touching, that too without opening a new window / tab. 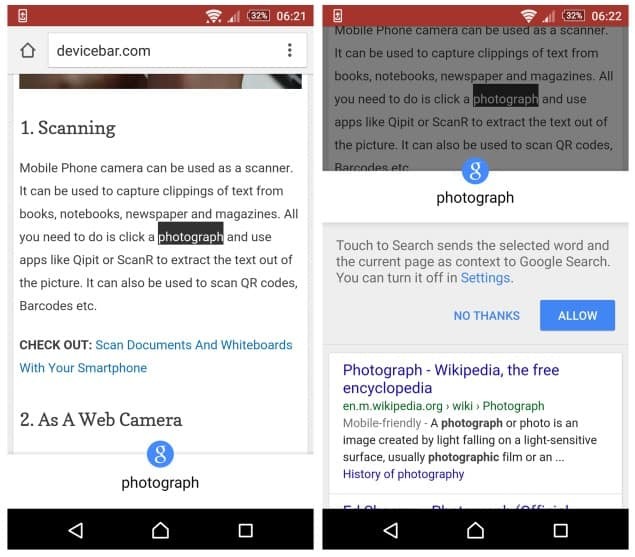 This is a very simple search trick for Google Chrome (Android) and I’m glad they implemented it. I tested this on our blog post, I selected the word ‘photograph’ and as soon as I selected it, I got a little popup at the bottom. When you pull that, it shows the definition of that word, or the search result (usually Wikipedia) for that word. You can see them in the screenshots above. This is really a great feature and saves a lot of time while browsing. I usually open new tabs or windows whenever I search for something, now this is gonna save me from that. If you are not comfortable with this feature, you can also turn it off. But I really love it, so I’m not going to do it. I heard this feature is slowly rolling out, do check this in your Android smartphone’s Chrome browser and let us know whether you got it or not. Make sure you have the latest version of Chrome as well. Do let us know what you think about this feature as well, in the comments below.